Mason Family Dentistry | Dr. James Peters, D.D.S. Thank you for your interest in Mason Family Dentistry. We would like to introduce you to our office. Dr. James Peters grew up in Mason where his family owned and operated a small country store. Although his family moved away, he retained fond memories of this unique community. After finishing his dental degree at the University of Michigan, Dr. Peters and his wife, Amber, chose to return to Mason, opening his practice in 2001. At Mason Family Dentistry, our goal is to provide optimal comprehensive dental care while making your treatment as comfortable as possible. We believe in long-term relationships built upon clear communication. We strive to achieve healthy smiles through quality restorative and cosmetic services. We are committed to serving you and helping to make your dental experience more enjoyable. The opportunity to open a new practice has allowed us to provide you with the newest and safest treatment in dental technology. This includes advances such as white fillings, all-porcelain crowns, and the newest techniques in whitening. 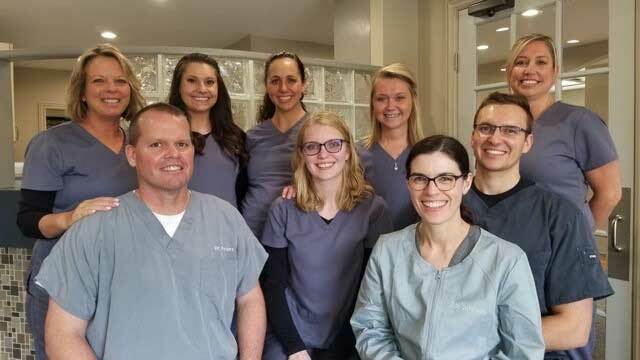 Along with our office manager Torie Harr, Patient Coordinator Laura Blair, Assistants Brooklynn O’Berry and Cody Lerash,, 3 Hygienists Johanna Winnie, Janean Belman and Bethany Williamson; we look forward to serving you. If you have any questions or special requests that could enable us to make your visit more comfortable, please feel free to contact our office.